Pax East will kick off next week, which means it’s prime time to tease fans with some new images of their favorite video games. Gearbox is hopping on the tease train again, thanks to a new tweet showing off an image of what appears to be Sato from Bulletstorm and the king, Duke Nukem himself. The image is captioned as well, with the quote “Time to tease another game for PAX!” This has led many fans to believe that Gearbox is teasing either a new Bulletstorm or a new Duke Nukem game. You can check out the tweet embedded above, or click here to see all the replies. As you can see in it, Sato appears to be looking at a small device on Duke Nukem’s wrist. While many have speculated that this will be a new game, it is possible that it could simply be something to do with Bulletstorm: Full Clip Edition. This was a special version of Bulletstorm that was released along with Duke Nukem’s Bulletstorm Tour, a DLC that allowed players to complete the game as Duke Nukem, complete with fully voice dialogue from Jon St. John. We've also included the image below so you can see it in it's full glory. Duke and Sato appear to be looking at his wrist very closely. If you never paid attention to Bulletstorm, then you really missed out. Heralded as the spiritual successor to Duke Nukem 3D, Bulletstorm offered a lot of the same action-packed violence that made the king’s original games so good. There’s really no telling exactly what Gearbox could be teasing here, but if fans have a Bulletstorm of Duke Nukem game to look forward to, then next week is going to be quite a thrill. 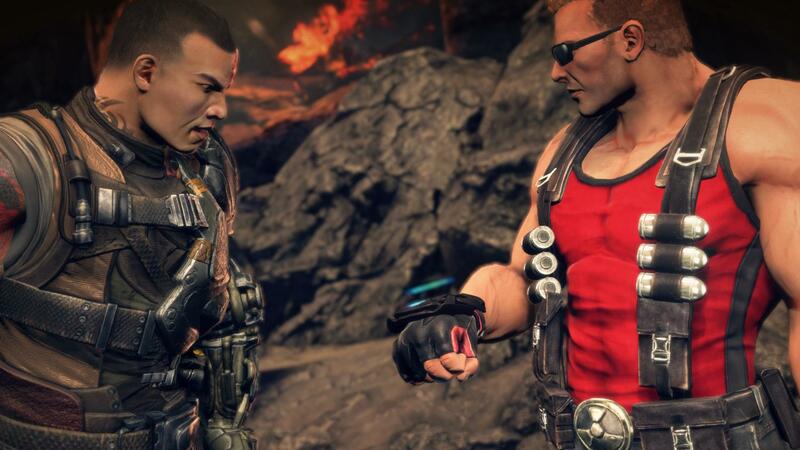 Either way, we can’t help but be excited about the prospect of a new game featuring Duke Nukem. Now all we have to do is wait and see what Gearbox has to reveal when Pax East rolls around next week. In other news, make sure you also check out the new Sekiro: Shadows Die Twice trailer. I'll take a Duke Nukem 3D port on Switch. Thanks!